I got this kit willed to me by a modeler friend that died of cancer. The kit comes in a very blousy shrink-wrapped tray and lid type box. It is a whopping 4 3/4" too long and 2 1/2" too wide. 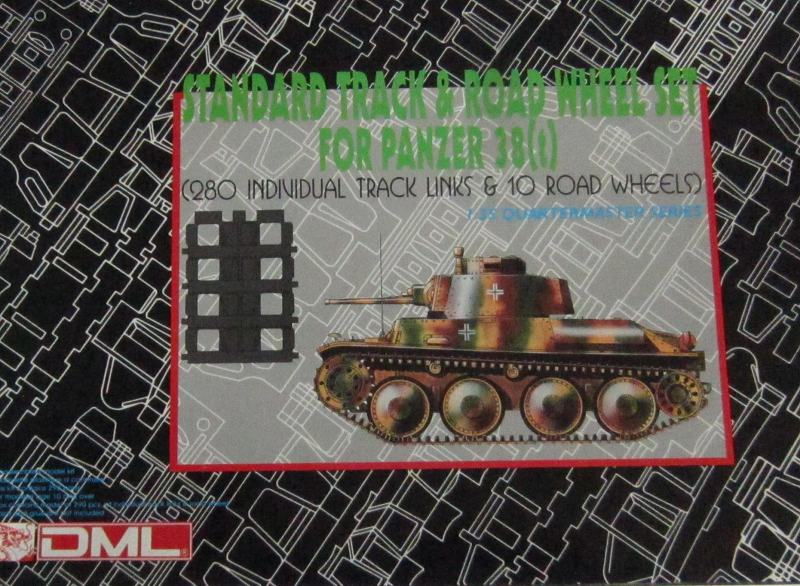 The box art shows a color illustration of a side view of a 38(t). It is in a wave pattern of dark-green and red-brown over a sand-yellow base with small skeletal German crosses on the sides of the turret and hull and an illustration of the track links. One corner of the box art says it is an unassembled model kit. 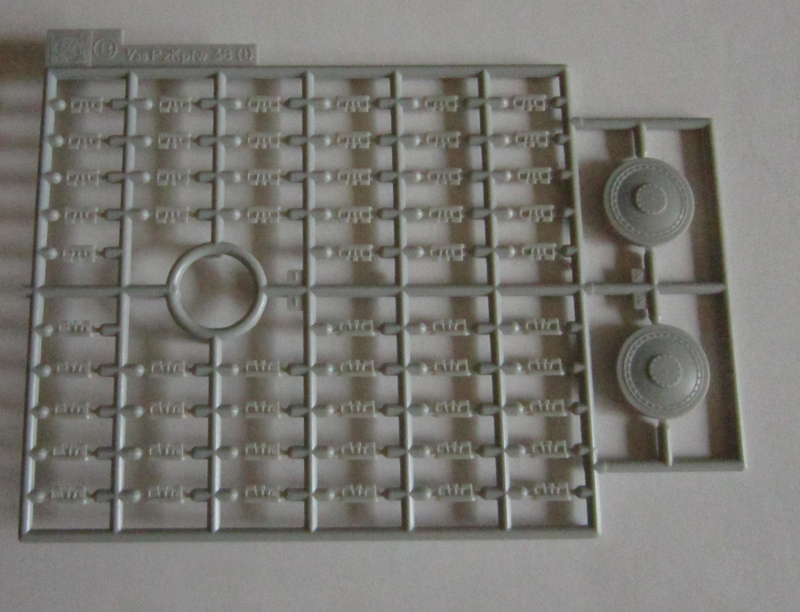 It contains 290 parts, is for modelers 10 and older and paint and glue are not included, in blue lettering. One side panel has a color box art of kit no. 9010, a U.S. M4A3 (76) with HVSS Sherman WWII Tank in 1/35th scale, that DML manufactures. ​The other side panel has a small black and white illustration of Panzer 38(t) Ausf. E/F 92 links track, and Marco Polo Import Inc's street address in City of Industry, CA and their FAX number. They were the U.S. distributor of DML kits in the 90's. Copyright date shown is 1994 and the kit was made in Hong Kong. The kit contains 5 identical light-gray trees in a sealed clear cello bag and the instructions. The instructions consists of a single-sheet printed on one side with a single assembly step drawing. Tree is alphabetized as letter B. Each tree holds 86 individual links and 2 road wheels. My deceased friend bought this kit to use on the Revell-Italeri Panzer 38(t) kit. That kit has vinyl rubber band type treads. The detail on them is rather good on both sides. However, my friend thought the individual links would dress the model up nicer.